Do you painstakingly fill lunch boxes with healthy foods only to have them come back… uneaten? Say goodbye to half-eaten lunches with these great recipes. Not only do they taste delicious – they’re also healthy and easy to make. Kids will get a lunch they’ll love – and you can be happy too, knowing that they’re not filling up on junk food. Scones offer a tasty alternative to sandwiches – and these scones are an even more nutritious version. Just stuff the scones with your usual fillings, and you have a healthy lunch with little effort. And did we mention that they taste delicious too? 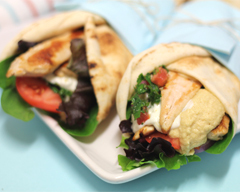 Low-fat, quick to make, nutritious, tasty – these chicken wraps may just be the perfect school lunch option. Just as well too, because after discovering these wraps in their lunch box, your kids will demand them every week. These wholemeal corn pikelets will jazz up any lunch box. Whether they’re for recess or the main event, these fibre-rich pikelets taste great, and give children the energy they need to power through the school day. Few lunch box options will get the reaction that these mini pita pizzas will. These pizzas are the perfect size for little tummies, are totally customisable, dead easy to make, fibre-rich and completely delicious. What more can you ask for? Hot or cold, these sausage rolls will disappear out of the lunch box in minutes. Deceptively nutritious, these sausage rolls combine kid-friendly flavours with hidden vegetables, protein and fibre. Beat that for a healthy school lunch. Leftover pasta from dinner the night before makes a great lunch box filler. Just pop it into a container, grate a little cheese on top, pack a fork, and you have lunch all ready to go. Easy. Vietnamese rice paper rolls are a guaranteed lunch box fave with kids who like a little taste of Asian flavours. They’re fast to make and full of fresh vegetables – and packed with a little ice pack, they’ll stand up to hours in the lunch box. Why buy rolls when you can make them? Sure, they’re a little more work than pulling out a bag of store-bought rolls but when you taste these crusty rolls, you’ll be pleased that you made the effort. Made with wholemeal flour, linseed and bran, homemade wholemeal rolls will make the most of your child’s favourite fillings. Scrolls mean lunch box victory every time, and these vegemite and cheese scrolls are no exception. While this recipe is a touch on the cheesy side, it’s boosted with the fibre of wholemeal flour and goodness of B12. Yummo. Do your kids love quiche in their lunch box, but you shudder at the fat levels? These cute mini quiches are fast, full of protein and bursting with (sneakily hidden) veggies. Even better, you can use last night’s leftover vegetables to fill them.